The nervous system is vital to the functioning of our bodies. Chiropractic adjustments can help with joint mobility which can have an impact on nerve and pain receptors— noninvasively, and without drugs. Pain relief is often a primary goal of chiropractic care. Types of pain that may be helped by adjustments include headaches, neck pain, sciatica, rib pain, and pain in the mid-to upper back (the thoracic region). Structural corrections are also a common goal of chiropractic care. It is important to note that chiropractic results can vary from person to person and none of the above treatment outcomes can be guaranteed. Sacro-Occipital Technique (SOT), designed to make corrections to the cranium, pelvis, extremities, and organs; also used for spinal adjusting. Advanced BioStructural Correction (ABC), which uses postural analyses to determine if there is a misalignment of the spinal column. 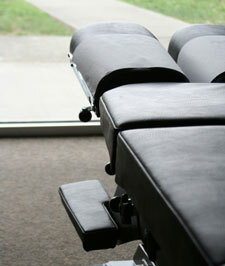 Thompson – the use of tables that have drop pieces to aid in gentle corrections of the spine. This stage is for people that are new to Chiropractic and/or have a spinal/ postural issue or some type of spine or nerve pain. This is where most pain for most people is relieved and more stability of the spine occurs. This is where the spinal muscles and ligaments can start to strengthen and can be necessary for those with more chronic spinal conditions. This stage is for those that want to have periodic spinal check ups and adjustments if needed throughout the year. This stage is also for those with chronic spinal issues like degenerated disc and joint disease and may need long term management of their condition.